↑ Smith, A.T. & Johnston, C.H. (2008). 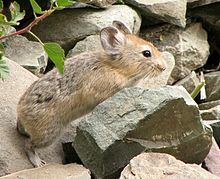 Ochotona macrotis. In: IUCN 2008. IUCN Red List of Threatened Species. Downloaded on 10 April 2009. Database entry includes a brief justification of why this species is of least concern.